The words ‘imposter syndrome’ have been in the media a great deal this week. Many famous people – like Tina Fey, Meryl Streep, Natalie Portman, Kate Winslet and Emma Watson have all said how they worry they are a ‘fraud’ and one day ‘everyone will find out’! Emma Watson once described this ‘fear of being caught out’ in an interview. “I’m just going, ‘Any moment, someone’s going to find out I’m a total fraud. I can’t possibly live up to what everyone thinks I am’,” she told Rookie Mag in 2013. Does this sound like you? Do you suffer anxiety and self doubt about what you do (when you shouldn’t!!)? Do you over-prepare or procrastinate because of this fear? Do you have trouble taking compliments and think luck or good timing played a part in where you are now? Do you set the bar too high and beat yourself up when you just make it? Do you feel relief rather than pride when you finish? Do you focus more on what you should do better than recognise what you have achieved? Do you worry people think you know more than you think you do or worry you know less than you should? A number of people I have worked with in recent months have mentioned similar things. Many of us wrestle with confidence challenges. Something ‘new’ comes into our line of sight and our default response is to ask ourselves ‘Can I do that?’ This can be a result of many factors including previous criticism, fear of the unknown, extremely high personal standards, competency as a core value, feeling unprepared, lack of skills or knowledge, poor time-management, comparisons to others, a need to be respected and previous failures. 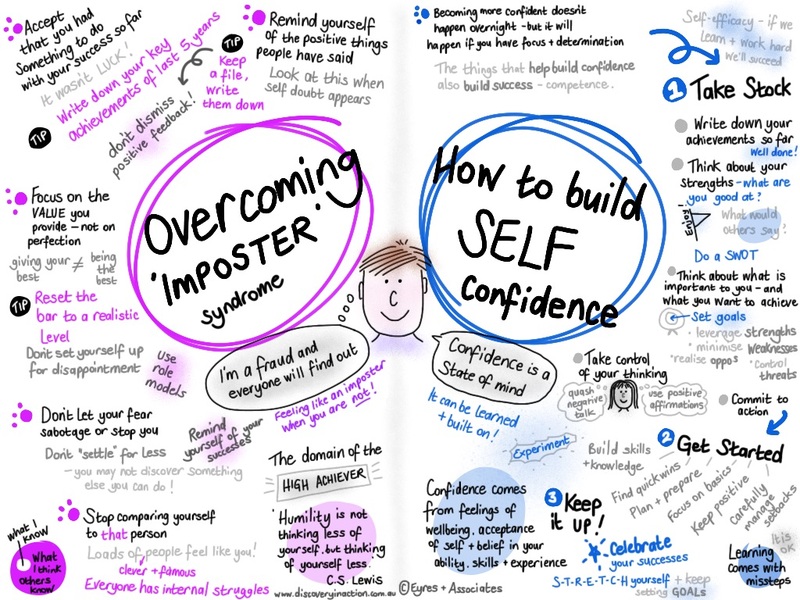 The good news is you can slowly overcome ‘imposter syndrome’ and build your confidence by actively following some of the tips we have described in the info graphic below. Confidence is a state of mind and can be learned. But you must focus and be determined to follow through on these ideas if you are going to move forward. b) help you to build self confidence.